The tennis backhand slice can be effectively utilized in numerous scenarios however the stroke is often underutilized. Tennis players utilize the slice to buy themselves more time to recover back to the center of the court, keep the ball low for their opponent, and as a change of pace during a rally. In scenarios where hitting the ball is uncomfortable on the backhand, commonly due to the ball being too high or too low, players tend to find more comfort hitting a slice backhand. As you turn your shoulders you want to transition over to the continental grip for your slice. There is wiggle room on which grip to utilize as several players use slight variations. When taking back the racquet you want your dominant forearm and your racket to form an L shape. 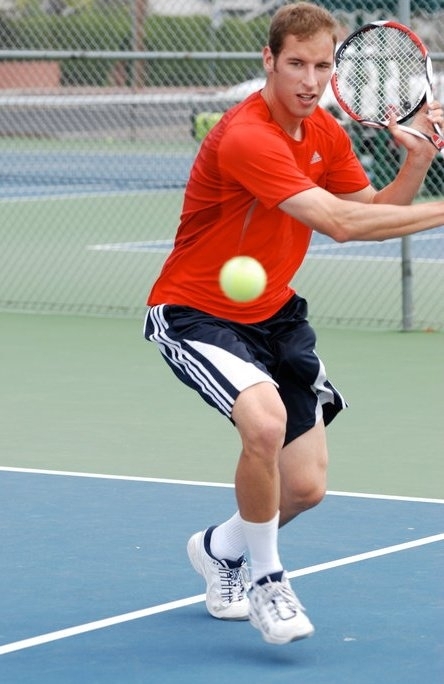 Your non-dominant hand will be holding the throat of the racquet with the elbow raised up away from the body. Both of your shoulders and arms will take the racquet all the way back, so that the racquet head is behind your head and above shoulder height. On the take back you can use your hands to keep the racquet face slightly open. Now that you have your weight loaded on your back foot and the racquet back all the way you are ready to step into the slice. Step into the ball just as you would on your one or two handed backhand with your foot angled around 45 degrees give or take. With your weight transitioning forward you want to swing your racquet high to low till you contact the ball. Your high to low swing will be initiated by your shoulder and will make contact with the ball around waist high and out in front of your body ideally. However, as mentioned previously the height at which you take the ball can vary. Although your swing is going high to low you want to think about hitting through the ball with a very slight high to low path of the racquet. Having the racket face slightly open to neutral, along with the low to high swing, will help impart the desired backspin on the ball. On the slice if you find that the ball takes off high up into the air, commonly it is due to having the racquet face angled open too much. Try closing the racquet face slightly until the ball begins to level out. On the slice if you find that the ball is sitting up in the air after it bounces rather than skidding and staying low after the bounce, you may be striking through the ball at too sever of a high to low angle. Try striking through the ball more at a very slight high to low plane until the ball begins to skid on the bounce and stay low. The follow through is the final step in the slice backhand and is important in order to create a smooth and consistent stroke. After you strike through the ball you want to let your arms naturally rise as they extend outwards. This will help you produce a smooth stroke while decelerating naturally. When striking through the ball and during the follow through you want to stay turned. Imagine you are standing in your hallway at home that was just freshly painted. You don’t want to hit or scratch the walls so you are going to stay turned, swinging your arms out in opposite directions so that you finish in a pose that would be similar to an image of a person holding a bucket of water in each hand with their arms extended out. By having your non-dominant arm swing out in the opposite direction as you hit the ball and follow through, your upper body will tend to stay closed and not open up. On the slice not opening up at contact is a good thing. What have you found that works or doesn’t work for your slice backhand? Let me know by leaving a comment below and come say hi to me on Facebook, I will definetley respond!